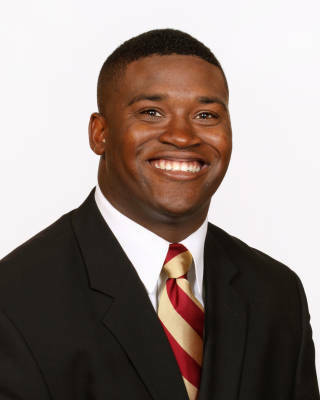 Versatile and productive senior fullback who was a mainstay in the lineup for four seasons…an outstanding blocker who played a key role in FSU’s resurgent running game, which averaged 205.9 yards a game and produced a single-season record 40 rushing touchdowns…a fixture in FSU’s two-back sets, he played in all 14 games and earned eight starts in 2012…had a career night in the Orange Bowl in his final game for Florida State finishing with career-highs in yards (134) on five carries, longest run (60) and tied a career-high with three receptions…named the Orange Bowl MVP as three of the four longest runs of his career came in the game including touchdown runs of 60 yards and 37 yards…opened the year with a career-best, three-touchdown performance in FSU’s win over Murray State…led all running backs averaging 8.0 yards per carry as he finished the season rushing for 376 yards on 47 carries with eight touchdowns, while adding 13 receptions for 117 yards…major contributor to an FSU offense in 2012 which will go down in school history as the most productive ever racking up a school record 6,591 yards which surpassed the 2000 team for the most yards…capped off his career leading FSU to 534 yards of total offense which was the sixth game of over 500 yards of total offense in 2012registered a single-game career-high seven carries at USF…had a rushing touchdown in the win over No. 10 Clemson and two against Boston College…scored 23 career touchdowns – 18 rushing and five receiving…his 41 career receptions leads all active running backs… named one of four team captains…recipient of the Attitude Award on offense and Offensive Warrior award given by the strength and conditioning staff at the team’s annual banquet. Started eight of 13 games for the Seminoles and rushed for touchdowns versus NC State and Boston College giving him 10 career rushing touchdowns…caught a touchdown pass against Charleston Southern giving him five career receiving touchdowns and 15 total career touchdowns…had a much bigger impact carrying the ball over the last eight games…had just two rushes and two catches in the first five games of the season before adding 25 carries in the last eight games including multiple carries in five of those eight contests…finished the season with 27 carries for 74 yards (2.7 ypc)…picked up three awards at the team’s annual banquet – Mr. Skill Blocker Award, one of two leadership awards for the offense and one of two attitude awards for the offense. Primarily served as the Seminoles’ lead blocker from the fullback slot…his versatility drew comparisons from coach Jimbo Fisher to former FSU back Edgar Bennett…shared the team lead in touchdowns with seven (four rushing, three receiving)…had a pair of two-touchdown games with two through the air in the opener against Samford and two rushing against North Carolina…Pryor’s most productive rushing game by yards came against Maryland when he ran the ball three times for 45 yards…had 112 rushing yards on 23 carries on the season (4.9 avg)…added 69 receiving yards on 12 catches on the year…pushed his career touchdown total to 12. The only true freshman on offense to play in all 13 games…his four starts were the most by any true freshman…ranked third on the team with four rushing touchdowns and fifth with 156 rushing yards…scored two touchdowns in the BYU and Maryland victories, highlighted by his game-winning 3-yard plunge against the Terrapins with 1:14 remaining to secure a bowl berth…earlier in the Maryland game Pryor flashed his big-play ability when he raced 50 yards with a downfield option pitch from quarterback EJ Manuel for a touchdown…also established himself as an effective pass receiver out of the backfield, collecting 10 receptions for 132 yards on the season…his season-long 49-yard reception resulted in a touchdown pass from Christian Ponder at Clemson…he also returned four kickoffs for 21 yards on the season. Ranked as the nation’s 15th best running back according to Rivals.com and was a consensus four-star prospect…the Okeechobee High School standout was awarded Offensive Player of the Year honors by the Palm Beach Post and the Scripps Treasure Coast newspapers…rushed for 2,281 yards and 20 TDs as a senior…participated in the Offense-Defense All-American Bowl…earned 4A All-State honors twice after piling up more than 4,000 rushing yards and 40 TDs over his final two seasons…chose FSU after entertaining 17 FBS offers, including Florida, South Carolina, North Carolina, Boston College and Wake Forest…born February 22, 1990.